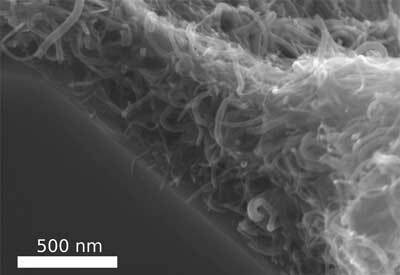 (Nanowerk News) Extremely lightweight, electrically highly conductive, and more stable than steel: due to their unique properties, carbon nanotubes would be ideal for numerous applications, from ultra-lightweight batteries to high-performance plastics, right through to medical implants. However, to date it has been difficult for science and industry to transfer the extraordinary characteristics at the nanoscale into a functional industrial application. The carbon nanotubes either cannot be combined adequately with other materials, or if they can be combined, they then lose their beneficial properties. Scientists from the Functional Nanomaterials working group at Kiel University (CAU) and the University of Trento have now developed an alternative method, with which the tiny tubes can be combined with other materials, so that they retain their characteristic properties. As such, they "felt" the thread-like tubes into a stable 3D network that is able to withstand extreme forces. The research results have now been published in Nature Communications ("Hierarchical self-entangled carbon nanotube tube networks"). Industry and science have been intensively researching the significantly less than one hundred nanometre wide carbon tubes (carbon nanotubes, CNTs), in order to make use of the extraordinary properties of rolled graphene. Yet much still remains just theory. "Although carbon nanotubes are flexible like fibre strands, they are also very sensitive to changes," explained Professor Rainer Adelung, head of the Functional Nanomaterials working group at the CAU. "With previous attempts to chemically connect them with other materials, their molecular structure also changed. This, however, made their properties deteriorate - mostly drastically." On the one hand, the stability of the ceramic scaffold increases so massively that it can bear 100,000 times its own weight. 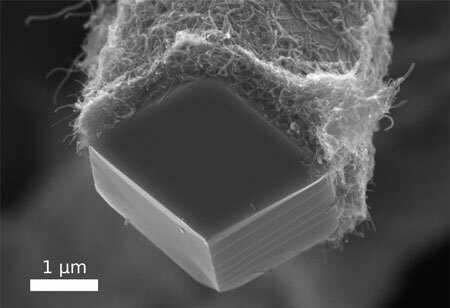 "With the CNT coating, the ceramic material can hold around 7.5kg, and without it just 50g - as if we had fitted it with a close-fitting pullover made of carbon nanotubes, which provide mechanical support," summarised first author Fabian Schütt. "The pressure on the material is absorbed by the tensile strength of the CNT felt. Compressive forces are transformed into tensile forces." The principle behind this is comparable with bamboo buildings, such as those widespread in Asia. Here, bamboo stems are bound so tightly with a simple rope that the lightweight material can form extremely stable scaffolding, and even entire buildings. "We do the same at the nano-scale with the CNT threads, which wrap themselves around the ceramic material - only much, much smaller," said Helge Krüger, co-author of the publication. The materials scientists were able to demonstrate another major advantage of their process. In a second step, they dissolved the ceramic scaffolding by using a chemical etching process. All that remains is a fine 3D network of tubes, each of which consists of a layer of tiny CNT tubes. In this way, the researchers were able to greatly increase the felt surface, and thus create more opportunities for reactions. "We basically pack the surface of an entire beach volleyball field into a one centimetre cube," explained Schütt. The huge hollow spaces inside the three-dimensional structure can then be filled with a polymer. As such, CNTs can be connected mechanically with plastics, without their molecular structure - and thus their properties - being modified. "We can specifically arrange the CNTs and manufacture an electrically conductive composite material. To do so only requires a fraction of the usual quantity of CNTs, in order to achieve the same conductivity," said Schütt. Applications for use range from battery and filter technology as a filling material for conductive plastics, implants for regenerative medicine, right through to sensors and electronic components at the nano-scale. The good electrical conductivity of the tear-resistant material could in future also be interesting for flexible electronics applications, in functional clothing or in the field of medical technology, for example. "Creating a plastic which, for example, stimulates bone or heart cells to grow is conceivable," said Adelung. Due to its simplicity, the scientists agree that the process could also be transferred to network structures made of other nanomaterials - which will further expand the range of possible applications.